If there's one food I would take with me on a deserted island, it would easily be cheese. With so many to choose from, how could I get sick of it?! Aside from all the wonderful cheese varieties out there, I do have a special place in my heart (and tummy) for cheese balls. I'm not talking about those neon orange puffs of corn packed up in large canisters. I'm talking about a blend of cream cheese, seasonings, spices and rolled in some kind of textured coating. They're often served around holidays but why limit it to only that time of year? 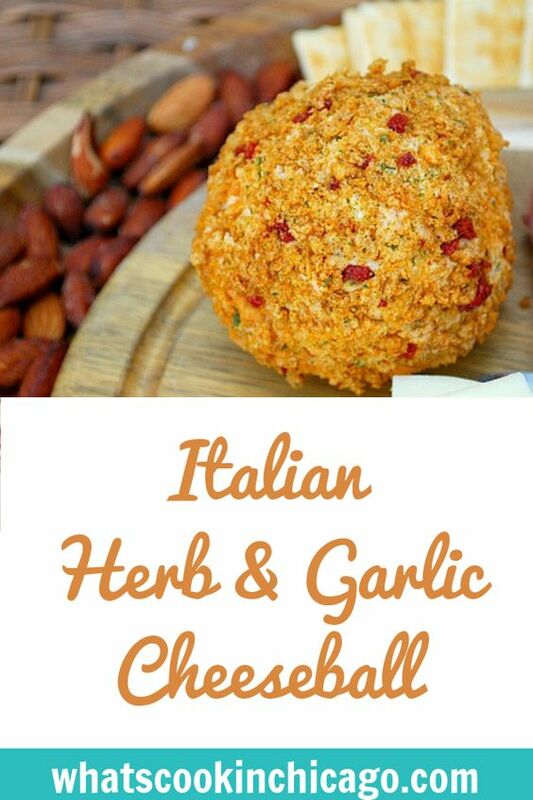 I love a good cheeseball and for our recent Tuscan Grill Party, I made this Italian Herb & Garlic Cheeseball for an antipasto platter. 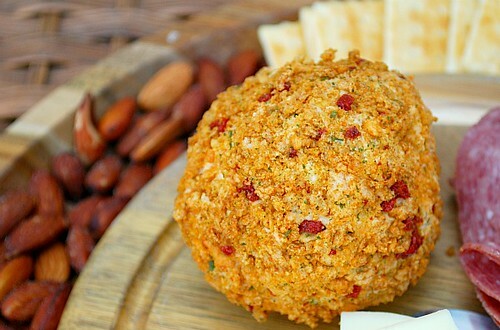 Smooth cream cheese and shredded mozzarella cheese is blended with a mixture of seasonings and spices, then coated in seasoned breadcrumbs and sun dried tomatoes. It's a delicious appetizer to spread on crackers or bread and served alongside nuts and fruit! The recipe I made was inspired by a recipe I found online. I used it as a guide and switched up some ingredients to make it a bit more flavorful and presentable. It's best to make this in advance, preferably a day ahead, to really allow the flavors to come through. But if you're short on time, you can get by with serving this an hour or two after making. For the sun dried tomatoes in the recipe, look for ones that are not packaged in oil but rather completely dried tomatoes. If you can't find that, you can substitute with oil packed tomatoes but be sure to dry them completely and minced finely. In a medium bowl, combine cream cheese, garlic, onion salt, oregano, parsley and black pepper. Add mozzarella cheese and continue to mix into the herb-cheese mixture until incorporated. Place cheese mixture onto a large sheet of plastic wrap. Gather up sides and quickly form mixture into a ball. Combine breadcrumbs and sun dried tomatoes into a small mixing bowl. Carefully remove cheeseball from plastic wrap and roll around in breadcrumbs to coat, pressing lightly. Wrap cheese ball in another sheet of saran wrap and chill for at least 1-2 hours for flavors to meld before serving. Serve with crackers or bread. Italian Herb and Garlic Cheeseball! How can I resist making this for my Italian husband? I've never come across cheeseballs before so I'm delighted to have found a new concept.